Everyone, greet the butternut squash in all its massive majestry. This thing, though it is a minor league pain in my behind, is also kind of awesome. 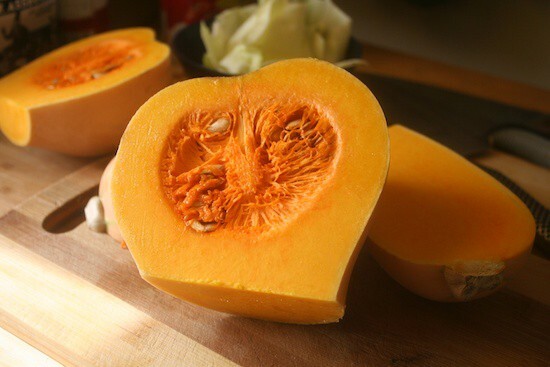 What is butternut squash, and how does it taste? 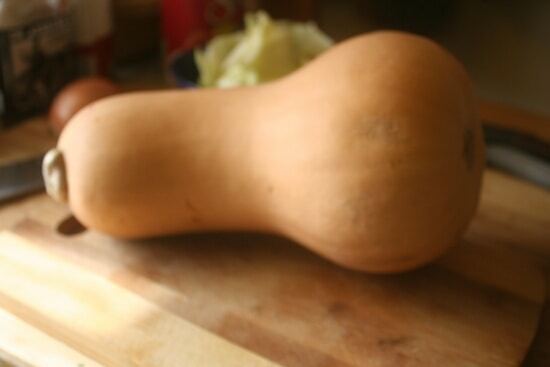 A butternut squash is a giant…squash. Seriously, they’re all the same.Turban squash, spaghetti squash, pumpkins, acorn squash… all variations on the same theme when it comes to winter squash. They all taste pretty similar, can all be cooked the same and are generally inexpensive to purchase at markets because so few people know what in the world to do with them. In fact, I’ll show you one of the fastest ways to cook butternut squash, but know that because so many of them taste so similar (the only reason “pumpkin pie” tastes the way we know pumpkin pie to taste is because of the spices, not the actual squash; that’s why so few people can tell the difference between sweet potato pie and pumpkin pie…they’re generally using the same spices), you could just as easily swap out butternut squash and swap in any of these. How do I choose good butternut squash? You want to look for one that is tall, big, and blemish-free. It should feel heavy – like, the weight of it should take you by surprise – and you shouldn’t be able to wrap your hand around the – ahem – shaft of it. Sorry, I’m not very mature. Also, you should know that you can also buy it in your frozen food section, and it’s just as tasty there. How do I store my squash after I’ve bought it? If it’s not cut open, it doesn’t have to take up refrigerator space. Whole winter squash can do quite fine on a table or in a pantry for a few weeks. If you’ve got it chopped up, wrap it tightly and refrigerate it. People love to roast butternut squash on its own with different herbs – rosemary, thyme, parsley – or mash and blend it up into soups. 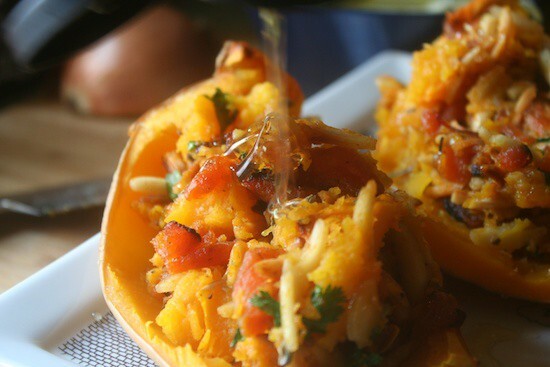 There’s also this recipe, photographed above, where you use the quartered skins of the squash to serve as stuffed boats with awesome stuff like apricots, almonds, parsley and honey. More on that, later. How do I cook the butternut squash I’ve bought for the boot camp? 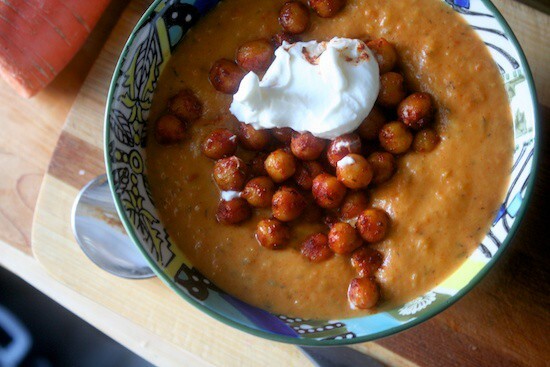 I like to make a smoky, spicy soup with chickpeas, and a giant dollop of greek yogurt on top. Quick, easy, tasty. Pre-heat your oven at 400 degrees. 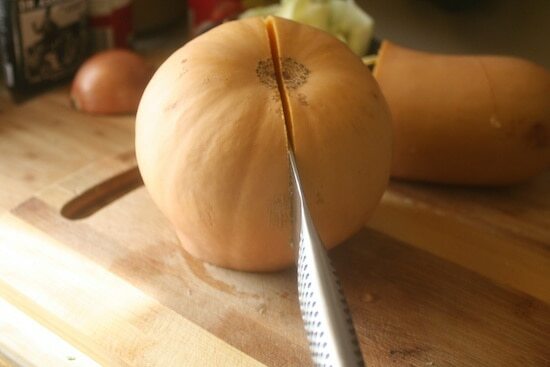 Cut your butternut squash into giant pieces. Cut it in half, splitting the base from the shaft – again, not mature – and then split the base in half, as well as the shaft. This should leave the seeds exposed, which you can roast on their own for a nice snack, or save and boil as a part of a broth, or toss. Your choice. Let that bad boy roast for about a half an hour. That’s enough time to yell at your kid…or your spouse… and prepare lunches for the next day… or maybe that’s just me. Grab a big carrot, slice it up in thin pieces. Do the same with a whole onion and a half of a stalk of celery. You might even throw in a clove of two of garlic. Don’t overthink it – keep it simple. 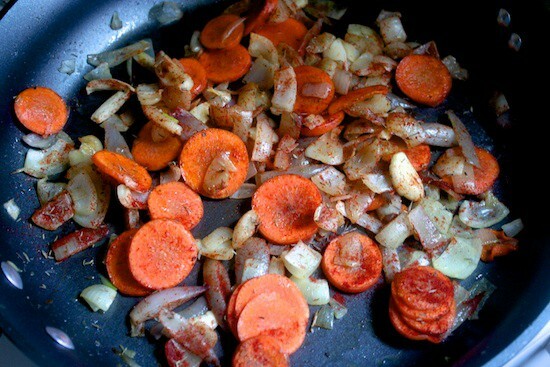 Cook it all together with a tablespoon of oil until your onions are translucent. Add in your makeshift mirepoix – celery, carrots and onions is a mirepoix – to your squash, and let it cook some more; for about long enough as it takes for you to prepare your food processor or your potato masher. If you have a food processor: Add half of your pot to the food processor, and let it go wild. Pour that back into the pot, and stir. Let it continue to cook. Pour half of the pot, again, into your food processor. Pour it back in, and let it cook a little bit more. One last time. Pour half of it into the processor, and puree. Drop it back in the pot and let it cook. Add 1 cup of light cream, and 1 cup of broth. If you can’t find light cream, use 1/3 of a cup of heavy cream, and add 2/3 of a cup of water. Add a quarter of a teaspoon of salt, a tablespoon of smoked paprika, a teaspoon of crushed red pepper flakes and a quarter of a teaspoon of black pepper. If you’re working without a food processor: A potato masher will work fine, you just won’t have as much of a puree. If you’re working from frozen squash: Use enough to give you at least 5 cups of squash. It should specify how much you get on the ingredients label. 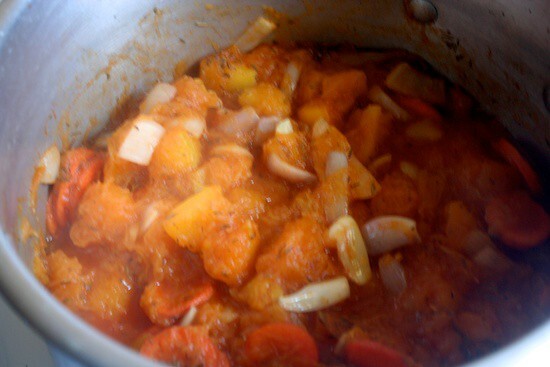 Toss your squash in a pot with 2 cups of broth (or water), and let them thaw, soften, and heat up. 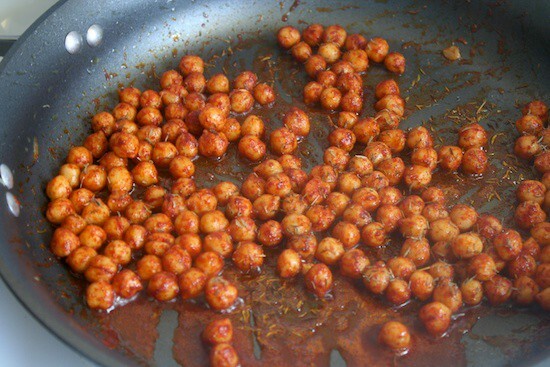 At this point, grab two cans of chickpeas (also known as garbanzo beans), and a tablespoon or organic canola oil. Pour your oil into a skillet, and drain your cans of beans so that very little excess liquid gets in your skillet. Once your oil heats up, drop in your beans. Add 1 tablespoon of smoked paprika, a tablespoon of thyme, a tiny pinch of cayenne pepper and a generous pinch of salt to the skillet. Stir your chickpeas around enough that they’re thoroughly coated in the spices. Grab your bowls. Portion out your chickpeas – this recipe makes 3 big bowls – into the base of your bowls. Spoon your soup over the top. Drop a nice hunk of greek yogurt over the top. You’re done. I just recently subscribed to your site and I love it so far. 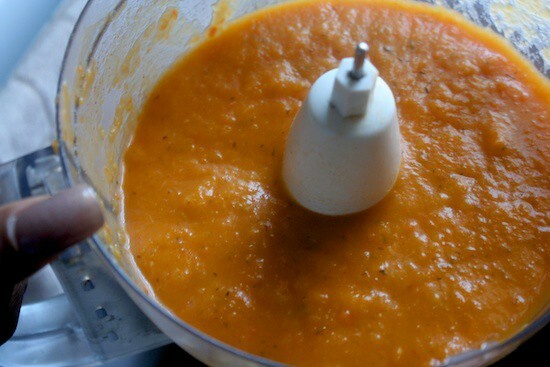 this butternut squash soup sounds wonderful and I want to try it. Is ther a way to print it out withou having to highlight all the pictures and everyhting and then print it. It wastes a lot of ink and paper I can’t afford to spend. My computer is no in my kitchen so I need to print it out and I also want to save it. I am disabled and trying to lose weight and get healthy. Putting an easy way for people to print out your recipe’s on your site would be very helpful. Yum, I love butternut squash.